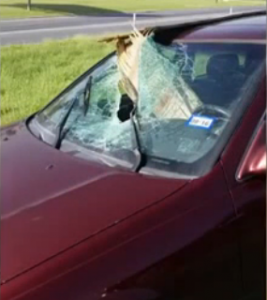 According to KRGV.com in Rio Grande Valley, Texas, debris from an unsecured load went through college student’s windshield earlier in November 2015. Unfortunately stories like this can always be found without having to look very hard. At our core we are safety company. We care about the safety of drivers on the road. We are continually looking for ways to educate drivers about the importance in securing their load. Securing loads helps keep your freight or cargo safe. Most importantly it helps to keep people safe from debris. This young Texas man was blessed. although he reported pulling broken glass out of his ears he escaped the accident without injury. Countless others are not so fortunate. Read the full story by KRGV. Please help spread the word about the importance of securing loads.